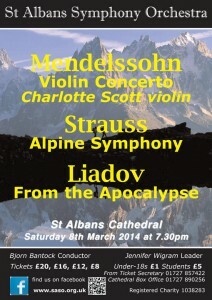 John Manning, critic of the Herts Advertiser, found Charlotte Scott’s performance of the Mendelssohn Violin Concerto at SASO’s March 8th concert “breathtaking” . He as also full of praise for the orchestra’s playing in Strauss’s epic Alpine Symphony which “did full justice to the work. Click here to read more from his review.